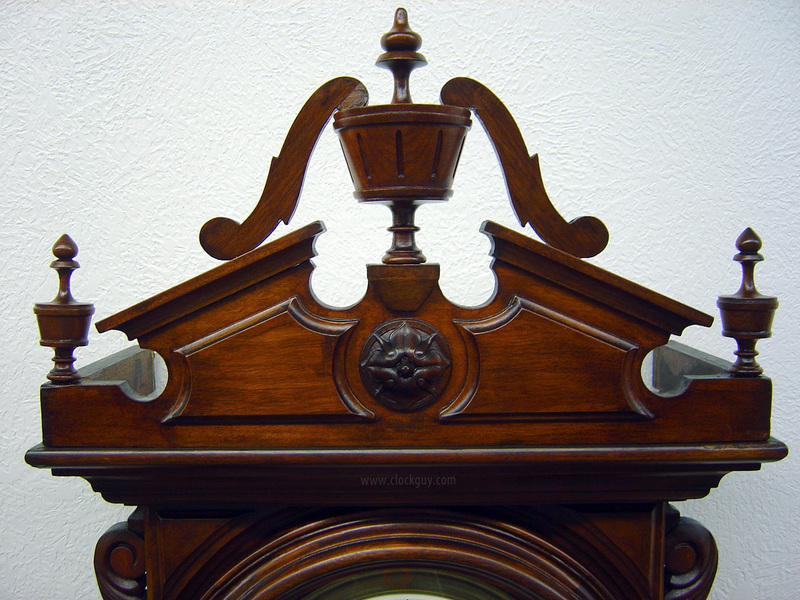 Antique Clocks Guy - American Wall Clocks - We bring collectors and buyers together. Always the highest quality antique clocks available. We need additional quality American weight-driven regulators. Do you have one to sell? Contact us! We don't see these beautiful Seth Thomas regulators frequently, as most collectors pass them on within the family. Regulator 18 was used primarily in commercial/industrial/railroad buildings, and some in schools. 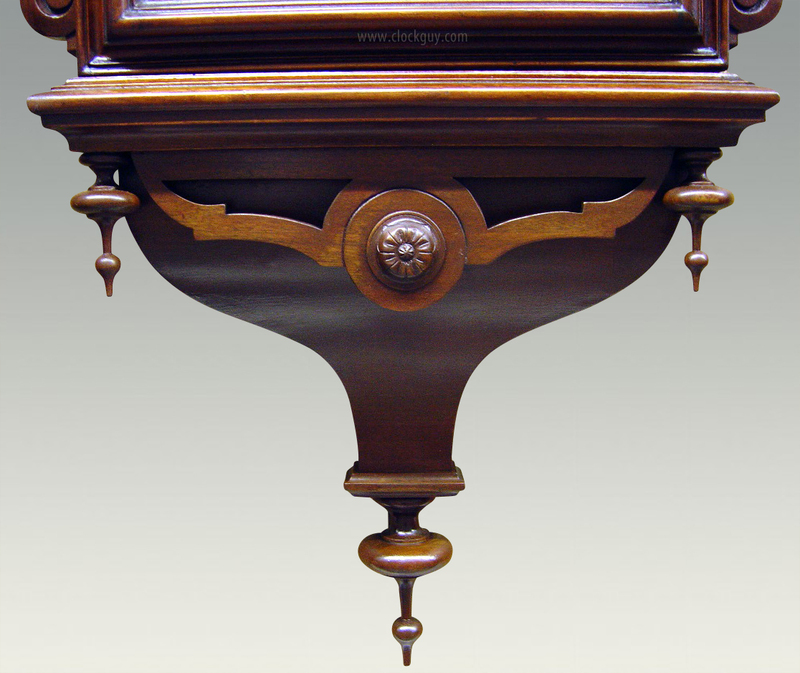 This one is in fancy burled walnut, making it extremely desirable relative to others we've seen in the past. 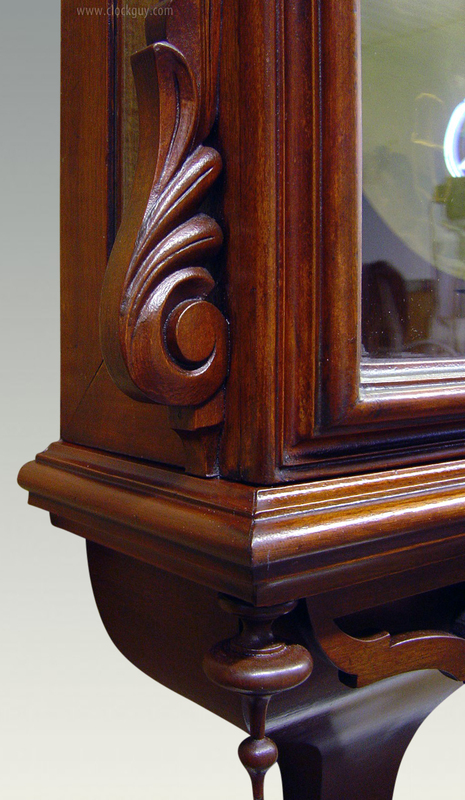 Physical: The walnut case measures 20"w x 53"h x 5.5"d and has the original finish with a nice, aged lustre. The veneer is all intact and in wonderful condition. 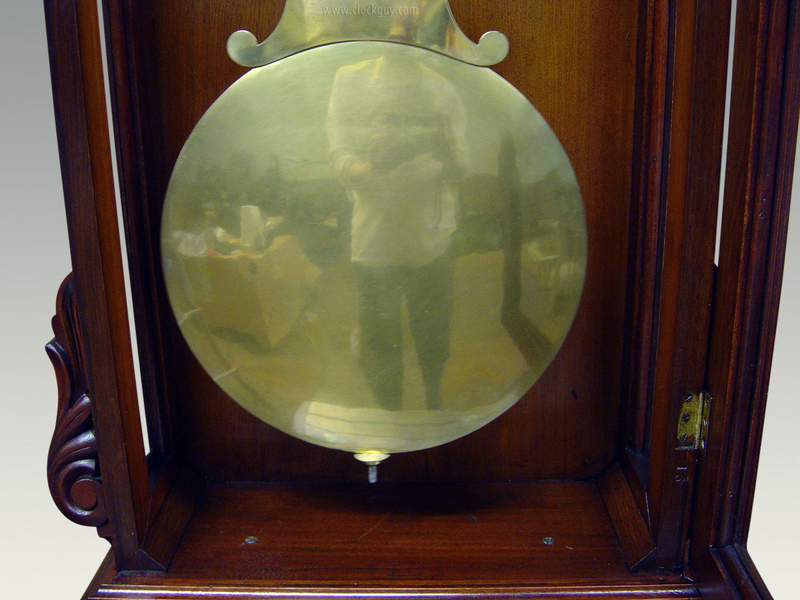 The large 13" (chapter ring) dial was repainted at some point in the past and is in excellent condition. 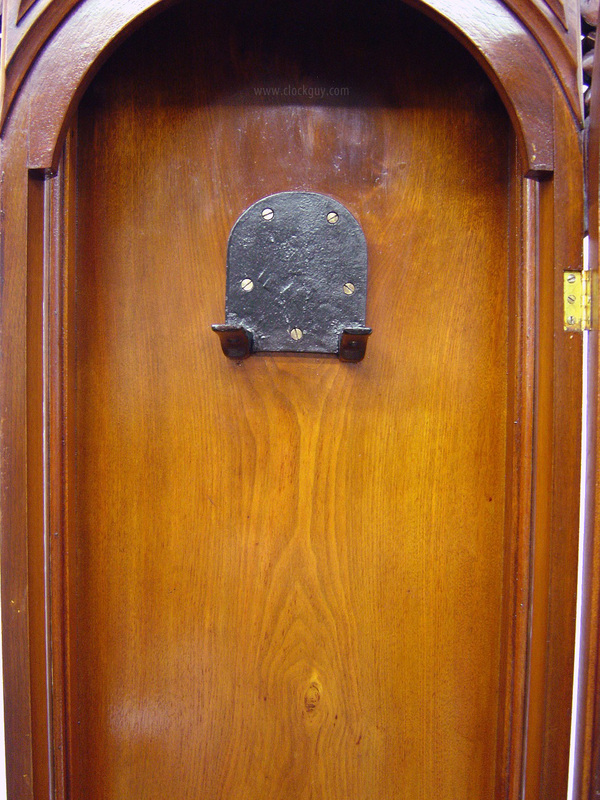 The back has a factory date stencil showing it was manufactured in the month of November, 1887. Note the wonderful damascened bob which, just by itself, is worth $500+. Mechanical: The eight-day, weight-driven movement features Graham escapement, lantern pinions, and maintaining/retaining power. It was recently professionally serviced and is in excellent running order. Comments: This is a wonderful big clock waiting for that special place in your home or office. If we had not downsized last year it would be hanging in our home! Here is one of the big, proud workhorses from E. Howard & Co., Boston. We believe this one was used as a master clock. Physical: The case (marked 7 • 1887), which we believe is black walnut (standard for this model) is in excellent physical condition and may have been overcoated in the past, but has a nice patina and has been cleaned and polished. It measures 18"w x 64"h x 6.5"d. The 12" diameter dial, which we believe has been repainted in the past, is in excellent physical condition. There is a signature and a 1916 date on the back of the dial. We don't know if that is related to a repair or possible repainting of the dial. There is a small pinhole at IX that may have had an electrical contact. 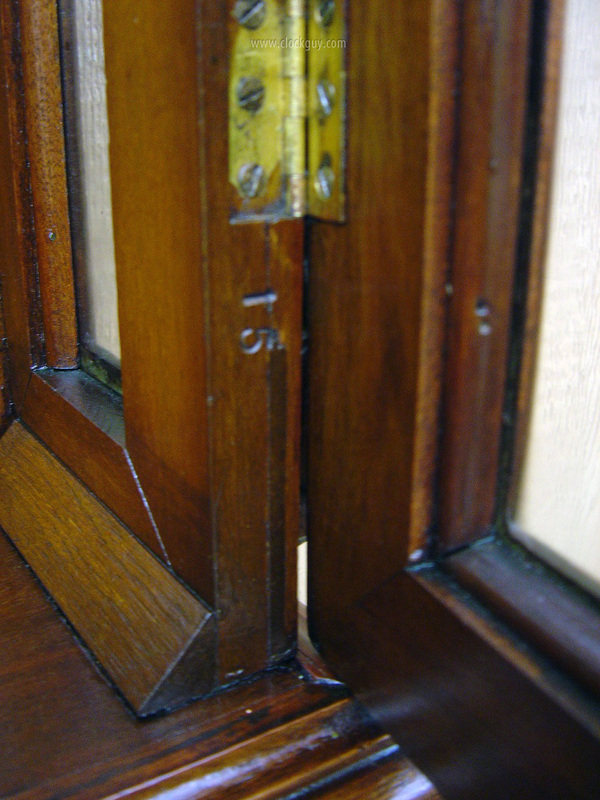 The lower glass has been refitted with age-appropriate wavy glass. The original, damascened pendulum bob is in excellent condition and there is a tie-down to secure the pendulum in transit. The weight is original. Mechanical: The eight-day, time-only, Graham deadbeat movement with retaining power is signed "E. Howard & Co. • Boston" It has just been professionally serviced and is in excellent running condition. Note the holes in the backboard beside the movement where the mounting brackets have been moved over the years. 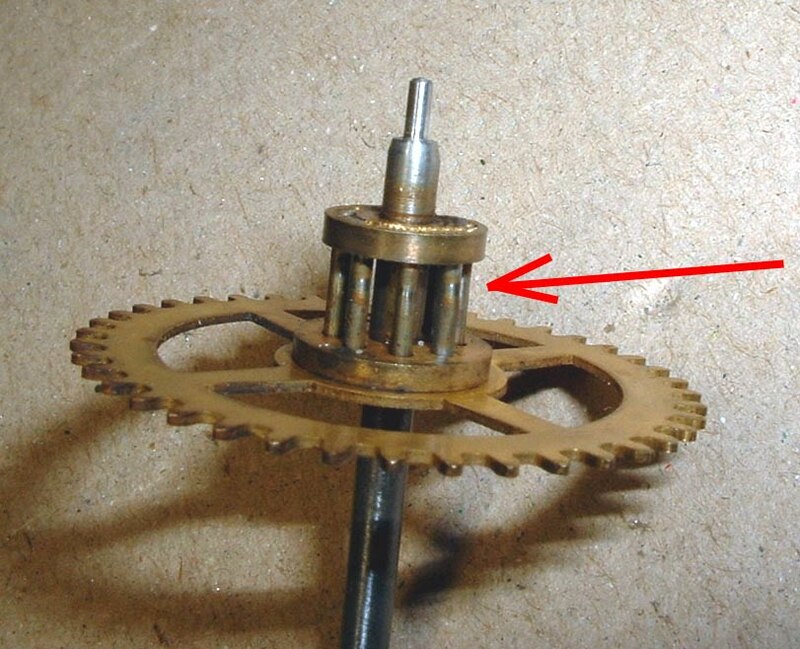 These are not atypical for Howard movements; metal brackets were used later to facilitate servicing the movement without removing screws in the backboard. Comments: Nice big clock waiting for a nice big wall in your nice big home... call us to make it your own! We'll assist in making shipping arrangements. We haven't had an E. Howard & Sons Regulator No. 89 in a number of years. They seem to grow more scarce every year as collectors put them into permanent collections, lowering the supply to the marketplace (but raising the joy to the collectors)! 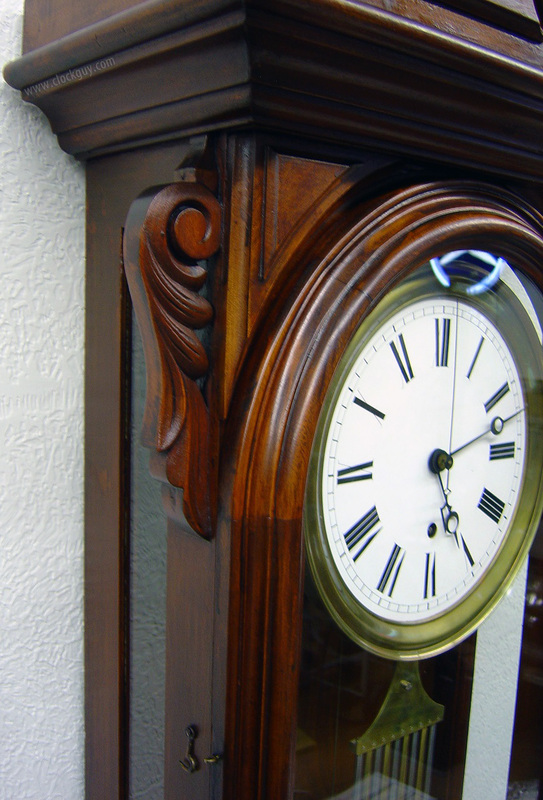 Generally used in industry, this clock is a little unusual as it has an original silvered dial instead of painted, and the "keyhole" glass is unusual to find on this model. Take a closer look at the photos and enjoy... before you call to make it your own. Physical: The quartered oak cabinet with original finish measures 19.5"w x 65"h x 8.5"d, is in excellent overall condition. There are some (typical for industrial use) dings on the bottom, but you're not really going to stand on your head to admire this clock, are you? The 12" original silvered dial is in excellent physical condition. 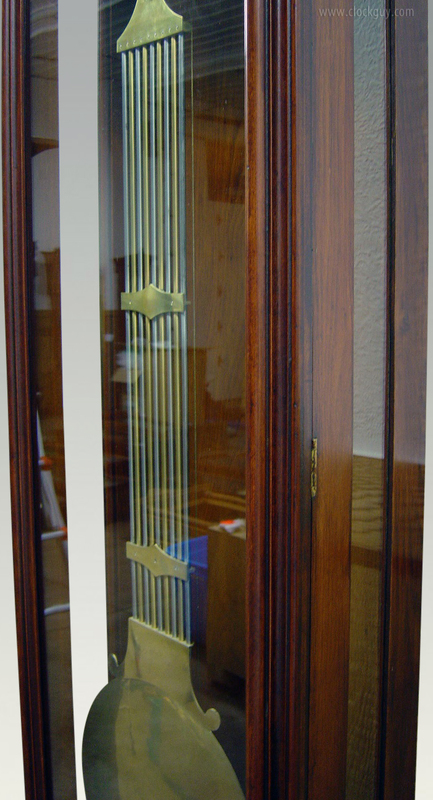 The damascened pendulum bob is original to the clock, with hold-down and in excellent condition. Imperfections are not notable in the glass, but the putty looks old. 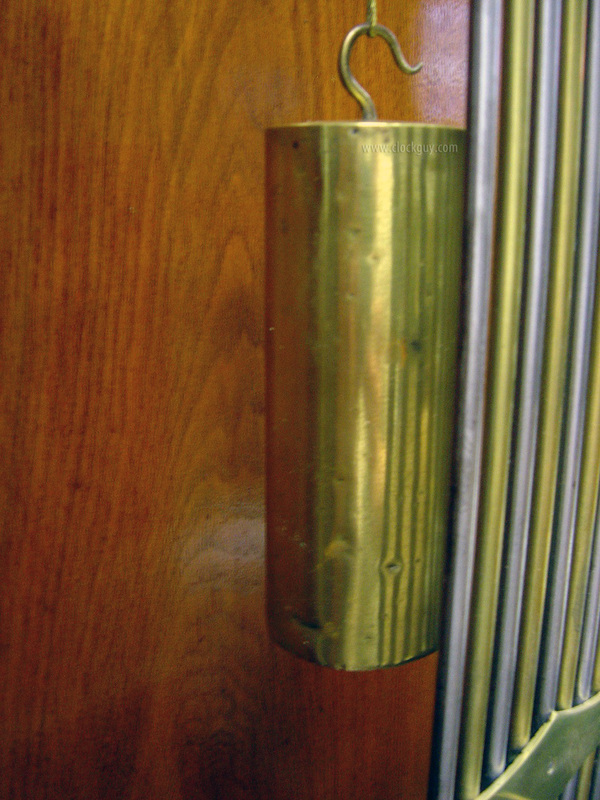 The gold-leafing on the pendulum stick appears to be original. Mechanical: The signed, eight-day, time-only, deadbeat, retaining-power precision movement has just been professionally overhauled and is in excellent running order, ready for years of great service in your home or office. The No. 1 weight is correct/original. The Seth Thomas Regulator No. 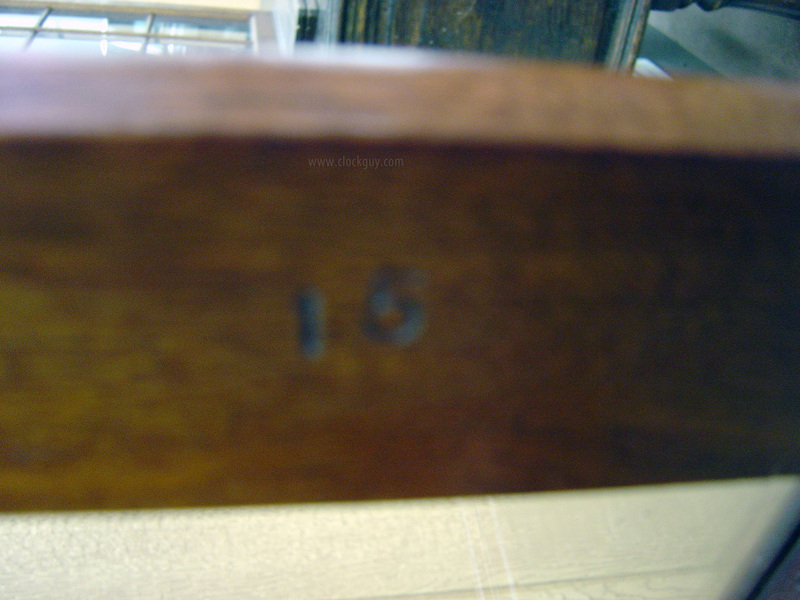 17 was generally used in industrial and railroad applications, most being made of oak and occasionally walnut. 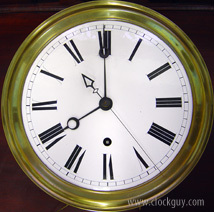 It was also used as a "double-time" railroad clock with two clock dials. This one apparently spent its life in a bank lobby. Physical: The oak case, which measures 19"w x 68"h x 7.25"d is in excellent overall condition. The exterior finish was beyond salvaging, so it was recently refinished by our old-world restoration shop using multiple coats of hand-rubbed shellac followed by hand-waxing. It has a beautiful, true-to-original lustre to it – actually nicer than it would have been coming out of the factory! 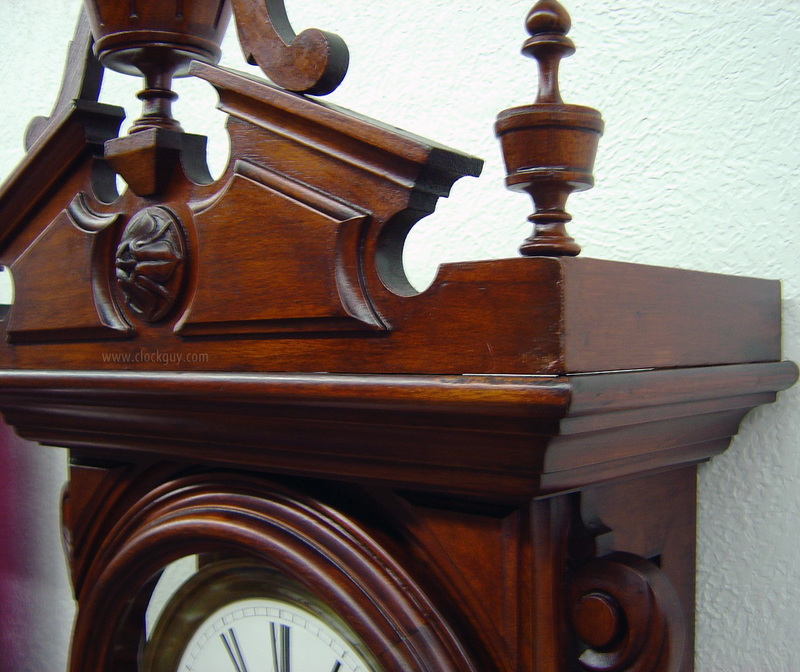 We have personally seen this clock pre- and post-restoration and can testify that it's a beauty. 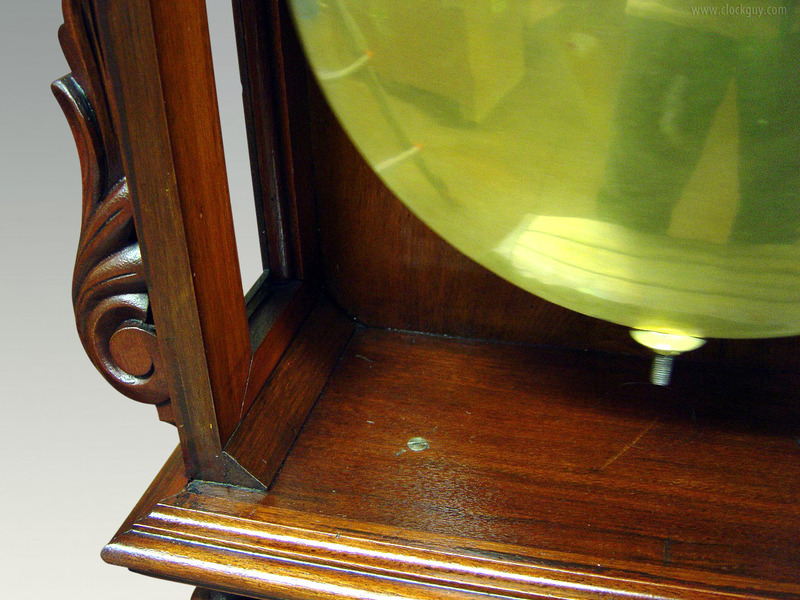 The 13.25" dial (chapter ring) retains the original paint and is in excellent, age-appropriate condition; the weight, pendulum, pulley and (wavy) glass are original and correct. Mechanical: The heavy-duty eight-day, sixty-beat time-only movement has been professionally overhauled and is in excellent running order. 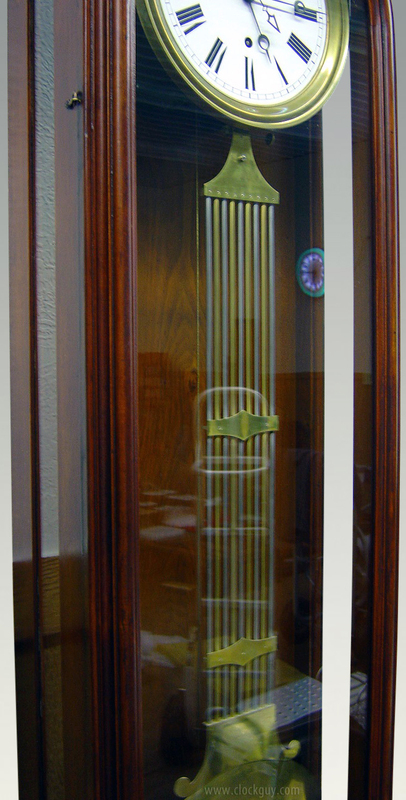 E.Howard & Co. made this clock in four sizes, renging from 3' with a 6" dial to this one that is 5'10" long with a 12" dial. Knowledgeable observers will immediately note that this is the same case as Regulator No. 71, the difference being that the 71 has a seconds bit (and would sell for nearly three times this amount if you were one of the handful of people in the world fortunate enough to find one)! Physical: The case, which measures 21"w x 70"h x 9"d is in spectacular condition. 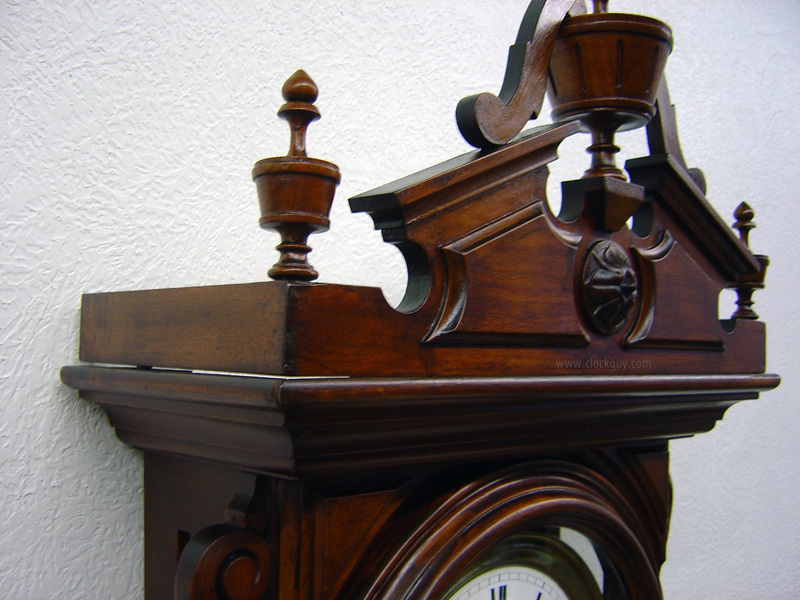 The top finial and one of the small bottom finials were carefully replicated and the case recoated by one of the top anqituities restorers on the West Coast. There is a small chip on the upper right finial which we turned to the front so you can see it in one of the photos, but it can be reversed so the chip is not visible. 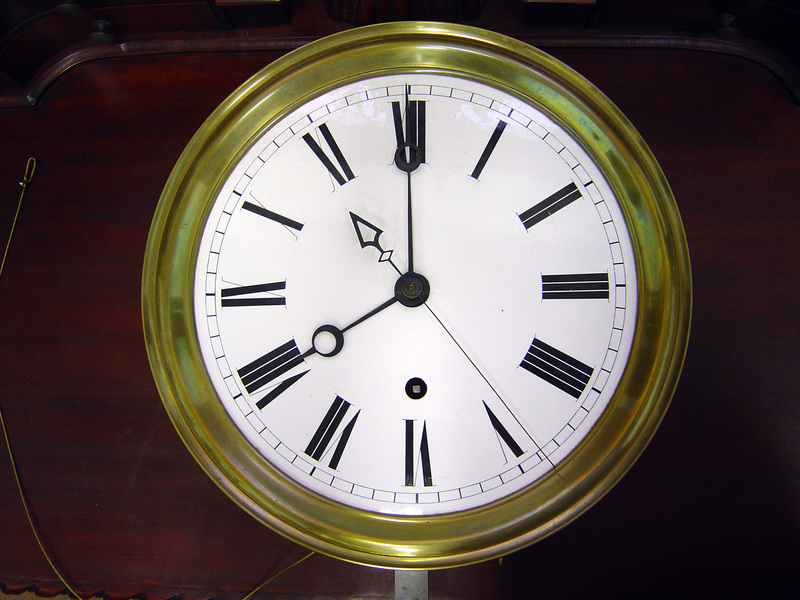 The 12" diameter dial was restored by the famous dial-painter, Martha Smallwood and is in excellent condition. Great pendulum bob, too! The glass has been properly replaced. Mechanical: The single-weight, time-only movement was professionally overhauled in 2006 and serviced again in 2011. It is in excellent running order. Comments: This beautiful, show-stopping clock will draw "oohs" and "ahs" wherever it's hung - in your home or office. Questions? Contact us by phone at , or byor e-mail. 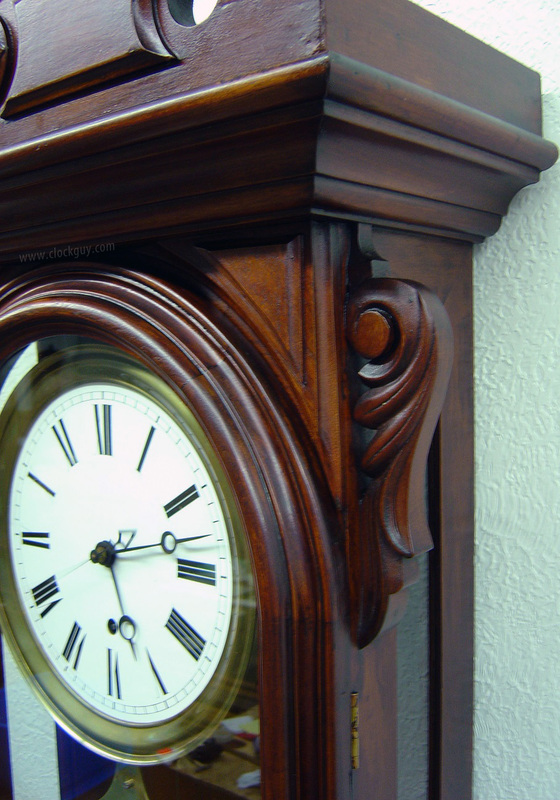 Although the clock is not signed anywhere and has no beat plate, this design and style is printed in the Jones catalog as Regulator No. 2. They have it listed as a dead beat escapement. 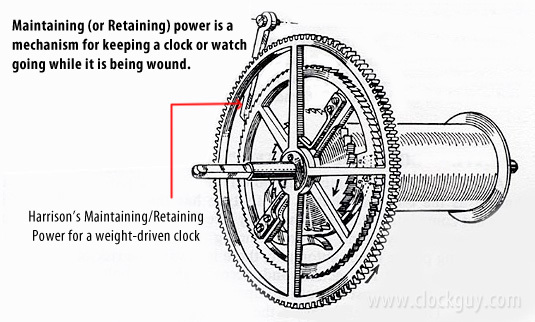 However, having seen several of this model over the years, we know they also offered it with a pinwheel escapement. 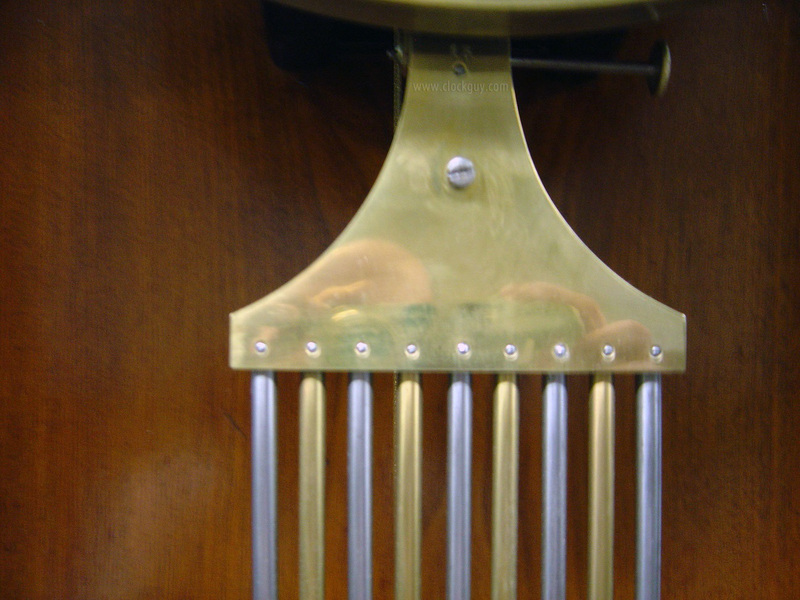 None we've seen have had beat plates on the lyre-type pendulum. 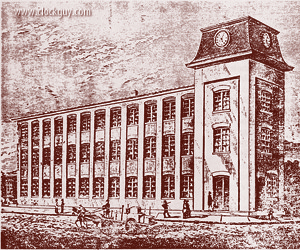 Ansonia bought out Jones' stock of cases and supplies at some point. 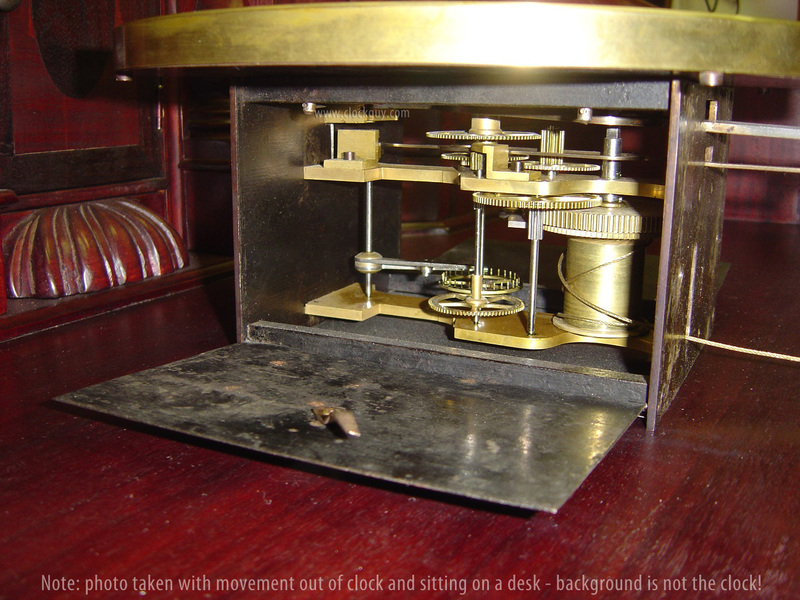 They used these cases and probably a stock of Jones movements and continued to offer them as they did with other models and movements (see the photo of the "Parisian" shelf clock in the Reference Library article and Tran "Longcase...", p.172). 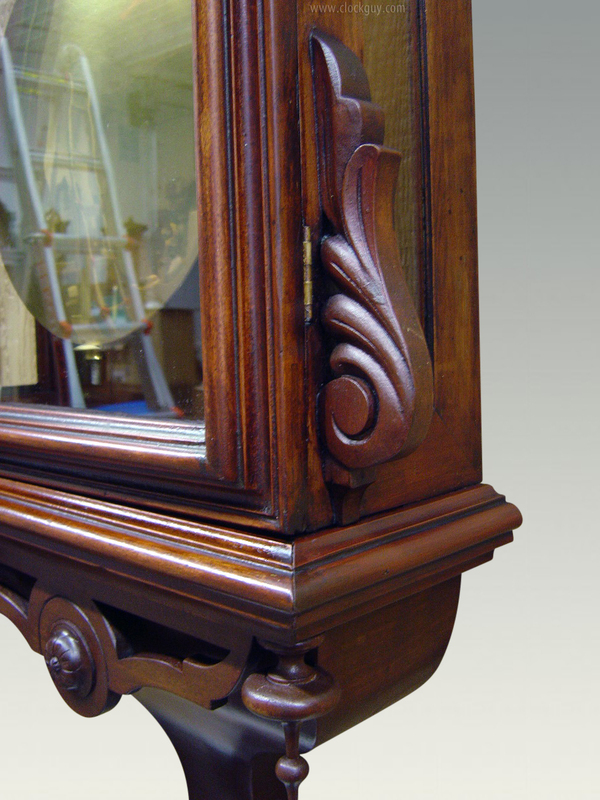 Physical: The exquisite walnut case, which measures 22"w x 91"h x 11-12"d is in excellent physical condition. We saw the clock on a prior visit to this very knowledgeable consignor's home, but he recently took these photos for us. We had the background cut out of most of them for clarity. Regarding the finish, the consignor reports "I don't think its been refinished per se but it has been cleaned of old dark finish and polished. Sold to me as being original condition. I'm not real sure, but the bottom may have been re-done but from the back it looks old and original." 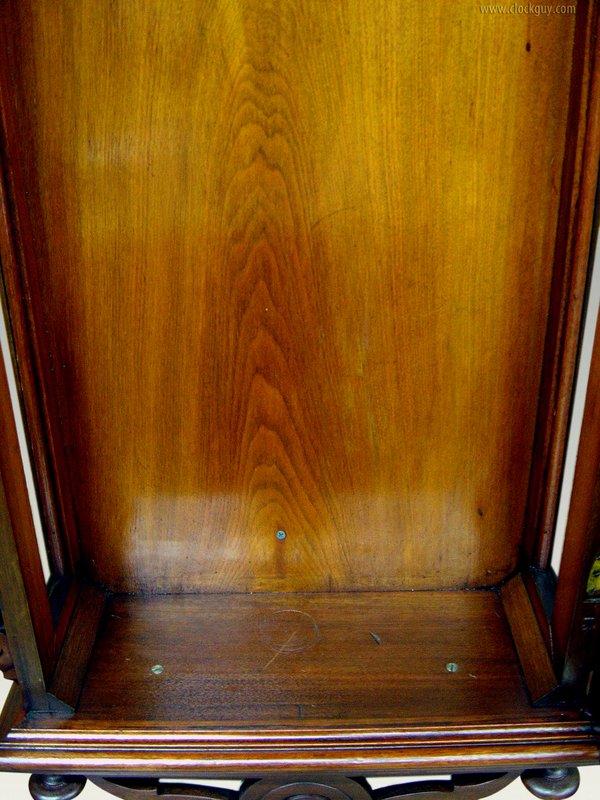 The pendulum-hanger, case and door are all stamped with the serial number 15. 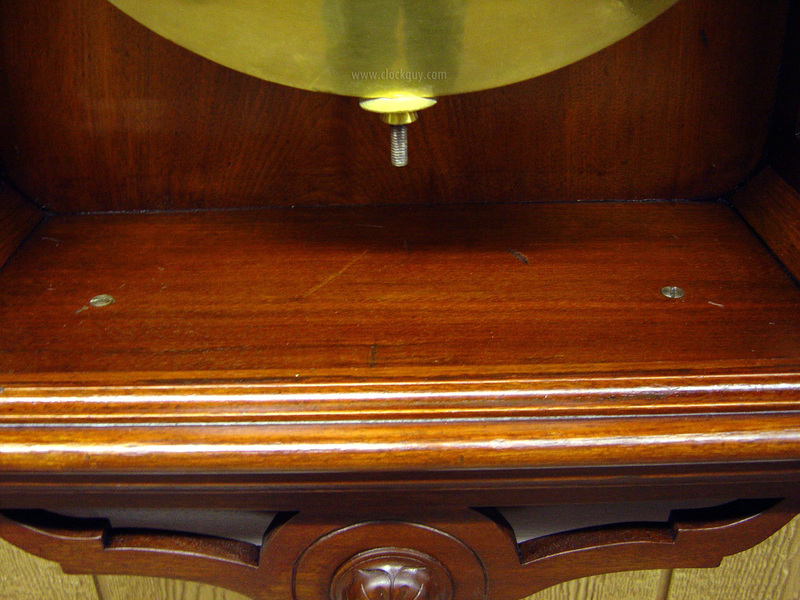 The pendulum bob has a diameter of 12". The porcelain dial with sweep seconds hand also has a diameter of 12". 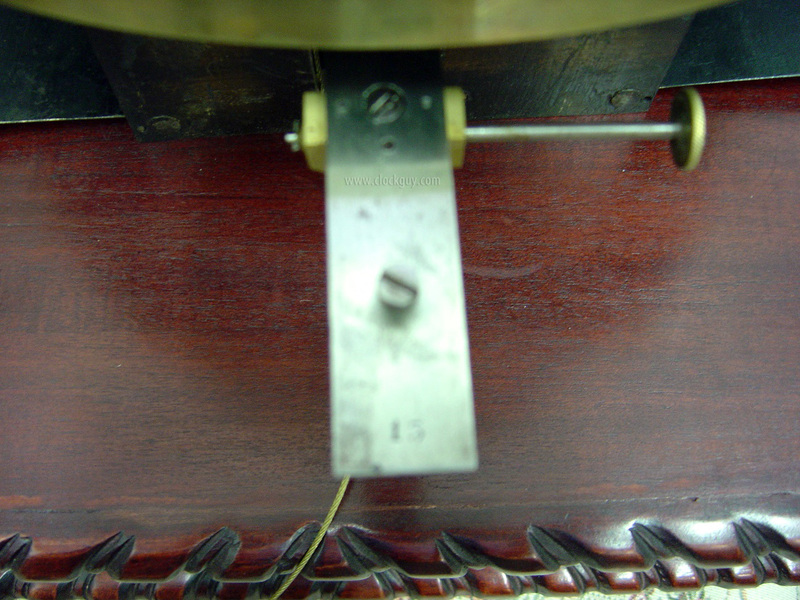 Our consignor reports that there are a couple of very small scratches, located at "6" and "12"; in the enlarged photo of the dial we were barely able to perceive this and would count it only as age-appropriate wear, not damage. The glass is old and has the typical waves in it. 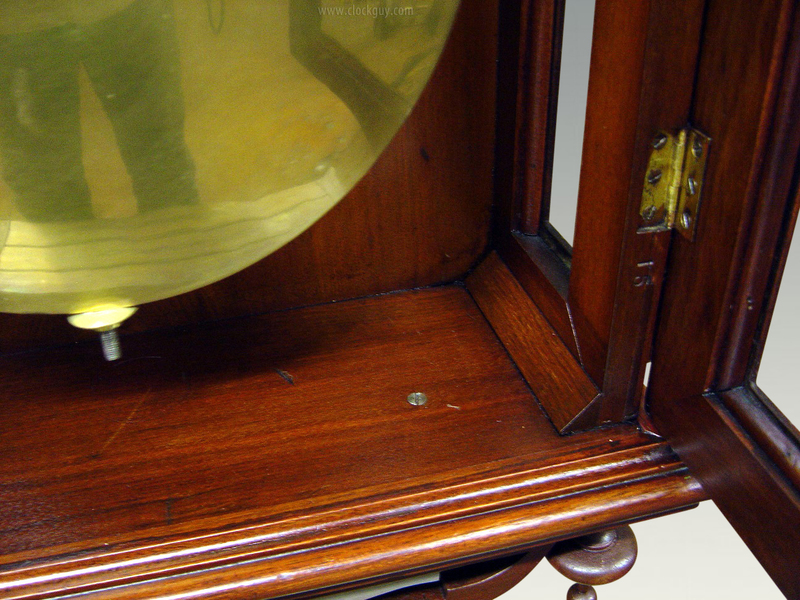 There are no extra holes in the case except for the stabilization screw behind the pendulum. Mechanical: The eight-day, single weight, maintaining-power, pinwheel movement is original to the clock and in excellent running order. Our consignor has offered to have it cleaned and re-lubricated prior to shipment. 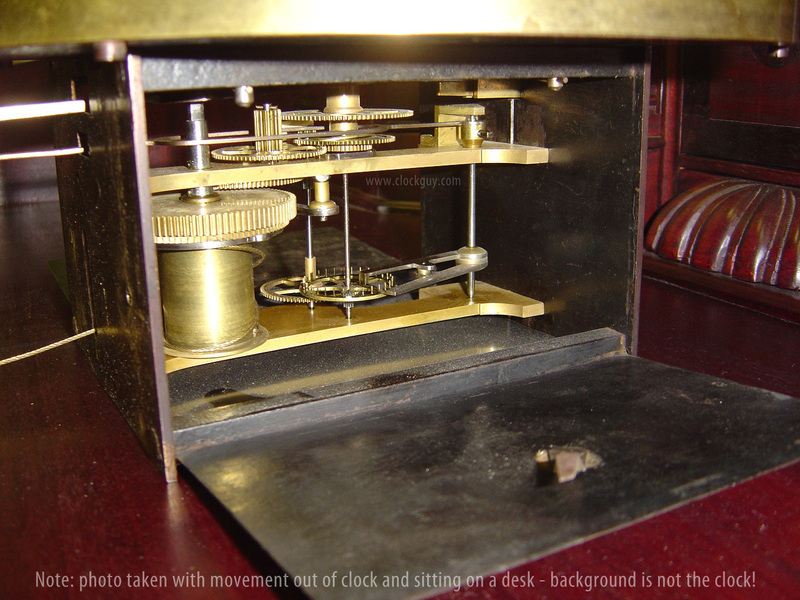 The movement is contained in an iron box as was typical of the imported French and Swiss pinwheel movements of the era. Comments: We have provided a twenty-six detailed photos below for your consideration. After viewing them, will you also consider giving us a call to make this clock your own(ed)? First caller wins!